Welcome to our Game In Progress review of Marvel’s Guardians Of The Galaxy: The Telltale Series. Nick Wanserski will be reviewing each episode of Telltale’s latest game series as they are released, diving into the story so far and the choices Star-Lord has made along the way. As always, we invite you to play and comment along. This first installment discusses specific plot details from the series’ premiere, Tangled Up In Blue. 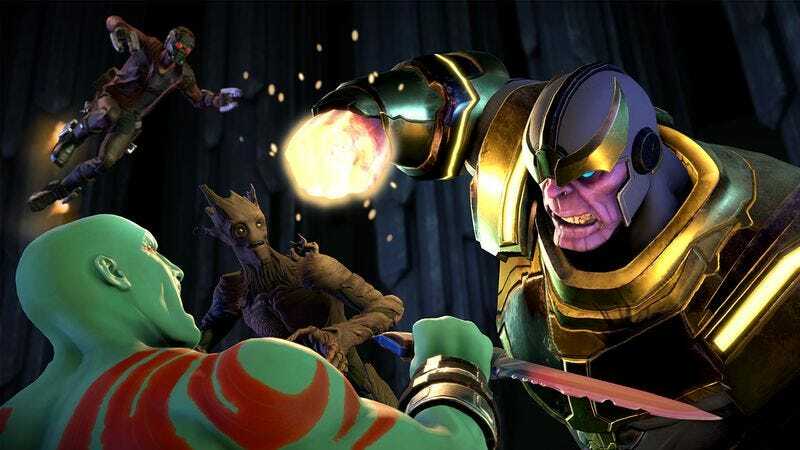 At first blush, an action-packed summer-blockbuster film franchise might seem like a strange choice for a series of games that focuses on dialogue and storytelling, but it doesn’t take long to see just how much sense Guardians Of The Galaxy makes for Telltale’s narrative-heavy games. As it turns out, having to juggle the needs of a crew of wildly disparate, borderline sociopathic space pirates offers a lot of great narrative opportunities. Tangled Up In Blue, the first episode of Marvel’s Guardians Of The Galaxy: The Telltale Series—an unwieldy snarl of brand obligations worthy of Rod Torfulson’s ARMADA featuring Herman Menderchuk—is a pulpy adventure with a strong grasp of what makes these characters interesting. The story begins with the crew coming to the aid of the Nova Corps, who enlist your help to prevent Thanos from retrieving an ancient Kree artifact. To that end, Rocket (Raccoon) promises he’s designed a one-shot gun powerful enough to dispatch the Mad Titan for good, and surprisingly, it does. After an extended fight with Thanos, a well-timed shot from Rocket’s creation punches a surprisingly graphic crater into the villain’s chest. So many of the Guardians have their stories wound up in Thanos that this gives the game a chance to explore what it means for the team when its members lack a shared antagonist to bind everyone together. Being a superhero comic, or more precisely a piece of interactive fiction based on a movie based on a comic, it’s implicitly understood Thanos isn’t gone for good, and there’s a fair amount of setup in this first episode that clearly points to how he will eventually return. Regardless, it’s still a bold choice and necessary to provide the narrative heft the game needs to stay engaging while working under a tight set of story restrictions, as it’s essentially a between-movie limbo where equilibrium must be maintained. Even more welcome, the story offers a chance to expand on young Peter Quill’s relationship with the single mother who raised him. Due to an unexplained quality of the techno-magical MacGuffin Thanos was seeking, Star-Lord travels into his past to relive a formative experience with his mom. The forced pathos of his mother’s death at the beginning of the first Guardians movie felt borderline exploitative, so it’s to the game’s credit that it develops their relationship into one with actual depth. Overall, the writing is solid and up to the challenge of tackling both of these story arcs. If the dialogue that propels the main story feels utilitarian at times, it’s made up for with the interactions that pop up around the edges. This is where the game’s best humor exists. One scene demonstrates how even the Guardians’ grand heroics aren’t exempt from the Nova Corps entrenched, fussy bureaucracy. A conversation with Drax has him idly eating space Oreos while contemplating a life without revenge. That attention to the script’s details helps build out these familiar characters, too. When Star-Lord makes a selfish choice, he does so with enough cocky self-awareness to read as charming instead of insufferable. Rocket is all bluster and swagger delivered with almost enough confidence to hide his vulnerability. Unfortunately, your interactions with Gamora are the flattest, a sad consequence of her being the most conventionally moral of the characters. It’s not all talk, though. The first episode has a few action scenes, but they’re sluggish. Flying through an asteroid field or battling Thanos, your fingers might itch for a more conventional game, to be able to fly, aim, and shoot. Languidly tilting from left to right as directed by on-screen arrows slows down what should be a kinetic, adrenaline-fueled set piece, but remembering what this game was designed to deliver silences those complaints. This is Telltale doing what Telltale does, and that certainly isn’t high-octane action. That said, there isn’t much apparent consequence to your decisions and performance during the first episode. If you manage to miss one of the game’s generous prompts in an action scene, one of your companions will inevitably be there to compensate for your screw up. Story wise, most of your dialogue choices seem to be seeding interactions for future episodes. Still, Tangled Up In Blue does a good job of setting up a scenario and cast interesting enough that I want to come back and see what’s next. Purchase Marvel’s Guardians Of The Galaxy: The Telltale Series here, which helps support The A.V. Club.